The Skellig Rocks can be seen to the right of the stone. We came across the site completely by accident. 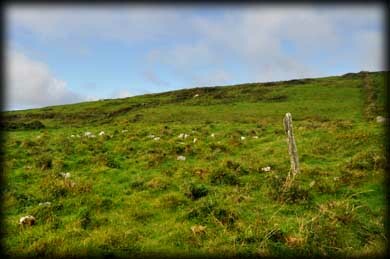 On our way up to the wedge tomb at Cool East we passed through Old Killeenadreena Graveyard. I wish I had done my homework before coming here because at first glance the site did not look that promising. There was a large pillar standing in the southeast quadrant of the enclosure and the stump of many gravemarkers sticking up through the long grass. The pillar turned out to be a 2.06 metre high cross inscribed ogham stone. 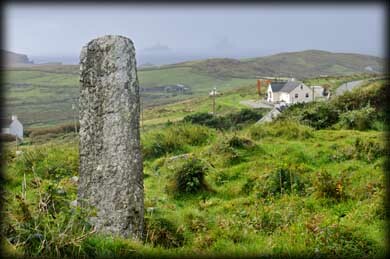 The ogham which is on the west face reads "LOGITTI MAQI ERPENN". Also located around the site are the remains of several huts, a shrine, a leacht and a holed stone. The site offers splendid views over Portmagee Channel to the mainland and out west to the Skelligs. Situated: From Portmagee drive on to Valentia Island, Staying on the R565 for 3 kilometres. Turn left for 1.3 kilometres. At the crossroads turn right and park passed the next gate on your left. The site is through the gate. Discovery Map 83: V 3769 7585. Last visit Sept 2012.